MIDTOWN, Manhattan (WABC) -- Sesame Street has once again taken over Madison Square Garden in the sunniest and funniest street celebration that features favorite Sesame Street pals Elmo, Abby Cadabby, Big Bird and many more in a brand-new sensory adventure live on stage called Sesame Street Live! Let's Party! While in the Big Apple, Elmo and Grover made a very special visit to patients at the Hospital for Special Surgery to help celebrate Valentine's Day. 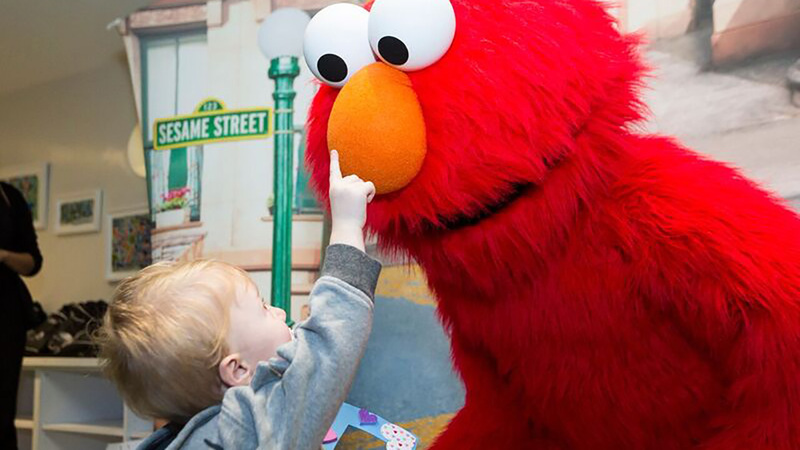 Elmo and Grover met with young patients with cerebral palsy, performed from the show and interacted with the children as they made crafts to celebrate friendship, sharing and inclusivity. The Hospital for Special Surgery is a partner organization of the Garden of Dreams Foundation, a not-for-profit charity that helps children facing obstacles in the Tri-State area. You can still see your Sesame Street favorites through February 19. --Thursday, February 15, 2018 with a show at 11 a.m.
--Friday, February 16, 2018 with a show at 11 a.m.
--Saturday, February 17, 2018 with shows at 10:30 a.m., 2 p.m. and 5:30 p.m.
--Sunday, February 18, 2018 with shows at 10:30 a.m., 2 p.m. and 5:30 p.m.
--Monday, February 19, 2018 with shows at 10:30 a.m. and 2 p.m.